Mitochondria are essential organelles in the cytosol of eukaryotic cells and evolved from a primitive Gram-negative bacterium that was ingested by an early eukaryotic cell, according to the endosymbiont theory (1). Mitochondria are probably best known as powerhouse of the cell because of their crucial role in energy conversion to synthesize the majority of cellular ATP. However, this classic view on their function is rather limited because the role of mitochondria has expanded enormously. For example, it has been established that mitochondria take center stage in a plethora of metabolic processes, including biosynthesis of lipids and amino acids. Moreover, these organelles play a key role in programmed cell death and signaling pathways. The wide spread involvement of mitochondria in different biochemical processes clearly emphasizes the essential nature of these organelles. It is therefore not surprising that mitochondrial defects result in different devastating human diseases such as muscular and neural pathologies (2). Mitochondria are surrounded by an inner and outer membrane similar as their ancestral bacteria. Both membranes separate two aqueous compartments: the intermembrane space (located between both membranes), and the matrix (enclosed by the inner membrane). Although mitochondria have retained their own genome and protein synthesis machinery, the vast majority of their genes have been transferred to the nucleus. In humans, the mitochondrial genome encodes for 13 hydrophobic membrane-embedded subunits of the respiratory chain, while 1500 proteins are imported from the cytosol (3). 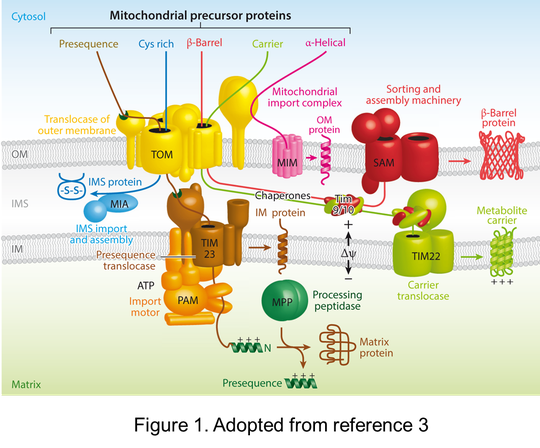 The import of protein precursors is performed by the TOM complex (translocase of the outer mitochondrial membrane), which functions as the main mitochondrial entry gate. Here, I will discuss recent structural advancements of the TOM complex, offering profound molecular insight into the mechanistic aspects of the mitochondrial protein import machinery. The transfer of mitochondrial genes to the nucleus could only occur if a system was in place that facilitated the reentry of “mitochondrial” proteins expressed in the cytosol into the mitochondrion. The evolution of such a reentry system required the development of a targeting and import mechanism. A targeting system is necessary to distinguish between proteins to be imported into the mitochondrion from the many other cytosolic proteins. All imported proteins contain either a cleavable presequence or an internal targeting signal. These are essential for delivering precursor proteins at the mitochondrion as well as the proper mitochondrial compartment (3). The import and sorting of precursor proteins is facilitated by different membrane-embedded translocation complexes, namely: the translocase of the outer membrane (TOM complex), translocase of the inner membrane (TIM complex). The sorting and assembly machinery for insertion of ß-barrel proteins into the outer membrane (SAM complex) and the presequence translocase-associated motor (PAM), which drives translocation into the matrix (figure 1). These translocation complexes recognize the targeting information in precursor proteins and assist their unfolding, membrane insertion or translocation across the membrane and assembly into oligomeric structures. The TOM complex facilitates the import of both cleavable and non-cleavable precursors. Following import, proteins are sorted by five different import pathways (figure 1) to reach their place of action in the mitochondrial outer membrane, intermembrane space, inner membrane or matrix, respectively. Genetic and biochemical experiments established the molecular composition of the TOM complex (figure 2). Specifically, the core of the complex is made up of a receptor protein (Tom22), the pore-forming subunit Tom40 and three small Tom proteins (Tom5, Tom6 and Tom7). Two other receptor proteins, Tom20 and Tom70, are loosely associated with the core complex. Tom20 and Tom70 are integrated into the outer membrane through their N-terminal transmembrane domain, while the globular receptor domains are located in the cytosol. 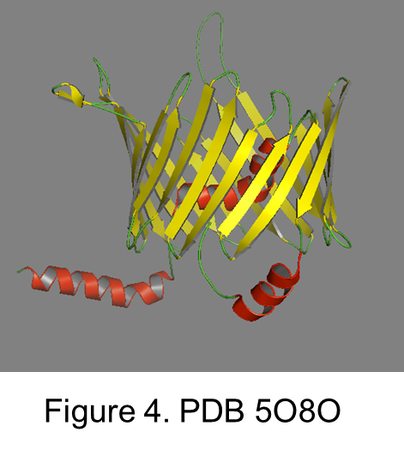 Tom22 is an integral membrane protein with its N and C-termini located in the cytosol and inter membrane space (3,4). Tom20 and Tom22 serve as receptors for signal peptide-bearing precursors. These proteins initially bind to Tom20 and are subsequently handed over to Tom22, the core receptor. Tom70 is a specialized receptor that recognizes inner membrane proteins with internal targeting sequences. All receptors share a similar substrate preference, although not fully overlapping, and can functionally replace each other (5). However, deletion of the genes encoding Tom20 and Tom70 is lethal in yeast, suggesting that at least one of these receptors is essential for growth (6). Tom40, the actual protein-conducting channel, is essential for viability in yeast and is a predicted cylindrical shaped transmembrane ß-barrel protein with 19 transmembrane ß-strands (see also my previous post on membrane protein structures). This protein is a member of the superfamily of voltage-dependent anion channel porins. Tom40 is not a passive conduit for substrate proteins – precursors directly contact Tom40 during membrane translocation, while presequences interact with Tom40 and induce a rapid gating of its channel activity (3,4). Tom5, Tom6 and Tom7 are three additional, small subunits, which are not essential for the translocation activity but play a role in maintaining the stability and assembly of the TOM complex (3,4). The Tom complex has a mass of about 400 kDa when analyzed under native conditions on blue native gels, consistent with a large oligomeric complex (7). The oligomeric state of Tom40 appears to be dynamic as the composition is controlled by its associated subunits. For example, reconstituted Tom40 forms monomers, while dimers of the Tom core complex have been observed by electron microscopy, and trimers for the holo complex. These results suggest that in vivo the Tom complex is made up of two to three channels (4). Although several high resolution structures of individual components of the Tom complex have been determined, structural information of the holo or core complex is scarce (8,9). Recently, the structure of the Tom core complex from Neurospora crassa has been established by cryo-electron microscopy (10). This shows that the core complex is a symmetrical dimer of 148 kDa and comprises two Tom40 ß-barrels that form a twin pore. The small subunits Tom5, Tom6 and Tom7 surround the twin pore, while Tom22, the central receptor, connects both Tom40 pores (figure 3). Based on these results a homology model for Tom40 was constructed using structure of murine VDAC1 as template (figure 4). This model shows that the 19 ß-strands (in yellow) of Tom40 are organized into a cylindrical shaped ß-barrel with large hydrophilic loops (in green) between the ß-strands protruding into the cytosol and short loops (in green) into the intermembrane space. The cytosolic loops may facilitate interaction with chaperones. The Tom40 pore has a diameter of about 20 Å. Moreover, Tom40 contains three helical segments (in red) of which one extends into the barrel and appears to stabilize the pore, while the other helices are located into the intermembrane space. Accumulating evidence suggests that mitochondria are involved in a myriad of biochemical functions, although they are best known as producers of cellular ATP. Because of their crucial biochemical role, mitochondrial dysfunction is associated with different human diseases, including neurodegenerative and metabolic disorders. Mitochondria are generally recognized as descendants from free living bacteria that were taken up by a primordial eukaryotic cell. Therefore, these organelles exhibit a lot of features reminiscent of their bacterial ancestors such as a double membrane which encloses the mitochondrion. During mitochondrial evolution, a lot of genes were transferred to nucleus and, consequently, the proteins encoded by these genes had to be imported. This necessitated the development of dedicated import and sorting machineries (3). The Tom (GIP) complex is used for the import of all nuclear-encoded proteins and serves as the main mitochondrial entry gate. This complex is made up of Tom40 (the protein-conducting channel), Tom20 and Tom22 (receptor proteins) as well as different auxiliary subunits (Tom5, Tom6 and Tom7) (4). The structure of the Tom core complex from Neurospora crassa has been established recently by cryo-oelectron microscopy (10). These structures allow a rationalization of protein translocation across the outer membrane (figure 3). Tom22, the central receptor, accepts protein substrates from Tom20 on the cytosolic face of the membrane. 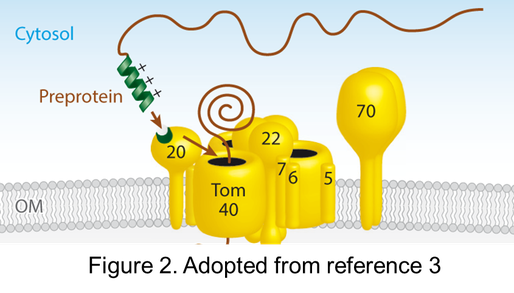 Tom20 and Tom5 jointly direct the protein to one of the Tom40 pores. 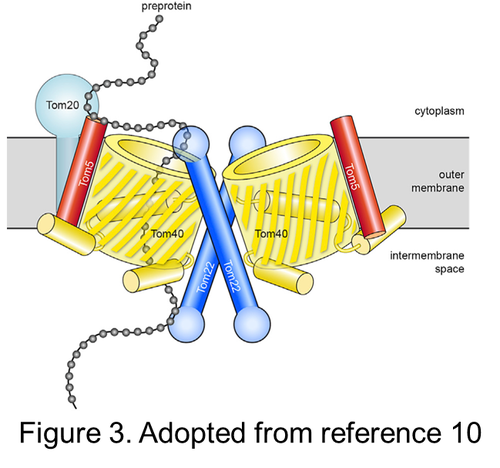 Following translocation, the protein is accepted by the intermembrane space domain of Tom22 and hand it over to the import and sorting machineries of the inner membrane. Although the cryo-EM structure of the Tom core complex reveals important molecular aspects of protein translocation across the mitochondrial outer membrane, more structural information of the mitochondrial import and sorting machineries is required to fully understand their mechanistic details. High resolution structures of the Tom, Tim and Sam complexes with and without substrate proteins are therefore highly welcomed but this represents a formidable challenge. Other important questions in the field of mitochondrial biogenesis are, for example, what cytosolic chaperones and targeting factors ensure an efficient delivery of preproteins at the Tom complex?, What are the targeting and sorting signals of inner membrane proteins and how are they interpreted by receptors and import and sorting systems? and how are substrate proteins transferred across the intermembrane space? 1. Gray, M.W., Burger, G., Lang, B.F. (2001). The origin and early evolution of mitochondria. 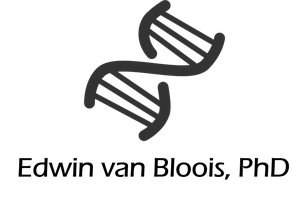 Genome Biol. 2: reviews1018.1–reviews1018.5. 2. Nunnari, J., Suomalainen, A. (2012). Mitochondria: in sickness and in health. Cell. 148: 1145-1159. 3. Wiedemann, N., Pfanner, N. (2017). Mitochondrial Machineries for Protein Import and Assembly. Annu Rev Biochem. 86: 685-714. 4. Perry, A.J., Rimmer, K.A., Mertens, H.D., Waller, R.F., Mulhern, T.D., Lithgow, T., Gooley, P.R. (2008). Structure, topology and function of the translocase of the outer membrane of mitochondria. Plant Physiol Biochem. 46: 265-74. 5. Yamano, K., Yatsukawa, Y., Esaki, M., Hobbs, A.E., Jensen, R.E., Endo, T. (2008). Tom20 and Tom22 share the common signal recognition pathway in mitochondrial protein import. J Biol Chem. 283: 3799-3807. 6. Ferramosca, A., Zara, V. (2013). Biogenesis of mitochondrial carrier proteins: molecular mechanisms of import into mitochondria. Biochim Biophys Acta. 1833: 494-502. 7. Becker, T., Pfannschmidt, S., Guiard, B., Stojanovski, D., Milenkovic, D., Kutik, S., Pfanner, N., Meisinger, C., Wiedemann, N. (2008). Biogenesis of the mitochondrial TOM complex: Mim1 promotes insertion and assembly of signal-anchored receptors. J Biol Chem. 283:120-127. 8. Wu, Y.., Sha, B. (2006). Crystal structure of yeast mitochondrial outer membrane translocon member Tom70p. Nat.Struct.Mol.Biol. 13: 589-593. 9. Perry, A.J., Hulett, J.M., Likic, V.A., Lithgow, T., Gooley, P.R. (2006). Convergent evolution of receptors for protein import into mitochondria. Curr.Biol. 16: 221-229. 10. Bausewein, T., Mills, D.J., Langer, J.D., Nitschke, B., Nussberger, S., Kühlbrandt, W. (2017). Cryo-EM Structure of the TOM Core Complex from Neurospora crassa. Cell. 170: 693-700.
prof premraj pushpakaran writes -- 2018 marks the 100th birth year of Paul Delos Boyer!! !